Home > Shop By Brand > McKee's 37 Waxes, Compounds, Coatings > McKee's 37 Tire Shine SiO2 Enhanced 128 oz. Give your tires the Silica treatment! McKee's 37 Tire Shine SiO2 Enhanced is a new take on your standard tire dressing. This innovative product uses Silica Dioxide, or SiO2, to provide protection that is much more resilient than traditional dressings. McKee's 37 Tire Shine SiO2 Enhanced allows you to adjust your level of shine and form fit it to your preference. This solvent-free formula will restore and protect your tires from UV rays that will cause them to crack and turn brown. McKee's 37 Tire Shine SiO2 Enhanced also dries to the touch, so you won't have to worry about potential risks of slinging after application. Your tires are one of the most, if not THE most, frequently replaced parts on your car, and for good reason. Your tires are exposed to the some of the most harmful conditions possible. Not only are they tasked with creating enough friction to keep your car on the road, but they are also subject to the slew contaminates that populate our roadways. These contaminates latch onto your rubber tires and quickly corrode them until they are faded and diminished figments of what they once were. The most effective way of protecting against this onslaught of contamination is to prevent them from sticking to the surface of your rubber. McKee's 37 Tire Shine SiO2 Enhanced acts as a barrier between your sensitive tires and keeps these harmful substances from corroding them. This is thanks to the hydrophobic properties created by the SiO2 in McKee's 37 Tire Shine SiO2 Enhanced. All the liquids and contaminants they contain will bead up on the surface of your wheels and never penetrate the surface. 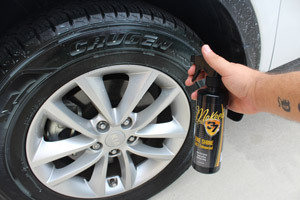 Applying a long-lasting tire shine with McKee's 37 Tire Shine SiO2 Enhanced is as easy as spraying directly onto the tire, and using a tire applicator to spread an even coat! McKee's 37 Tire Shine SiO2 Enhanced also contains UV-inhibitors and will greatly reduce the amount of UV rays to which your tires are exposed. UV rays are known to cause rubber surfaces to dry out and crack if they are heavily exposed. McKee's 37 Tire Shine SiO2 Enhanced will make sure that your tires are saved from the dull and cracked fate of UV exposure. McKee's 37 Tire Shine SiO2 Enhanced is designed to provide your preferred level of shine. The more coats of product you apply, the more gloss the finish will be. If you are a person who prefers a subtle, matte finish, then 1 or 2 coats is all you need. If you want a high shine, 3-4 will suit you fine. No matter how glossy you want your tires, McKee's 37 Tire Shine SiO2 Enhanced has you covered! Spray McKee's 37 Tire Shine SiO2 Enhanced either onto an applicator or directly onto the tires. 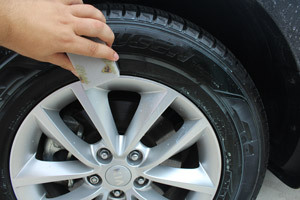 Spread McKee's 37 Tire Shine SiO2 Enhanced onto the wheel until an even coat is applied. Allow the product to dry. Repeat this process until your desired level of shine is achieved.